(Photo: Reuters / Chip East)Demonstrators stand behind a sign during an anti-nuclear weapons protest rally and march in New York May 2, 2010. 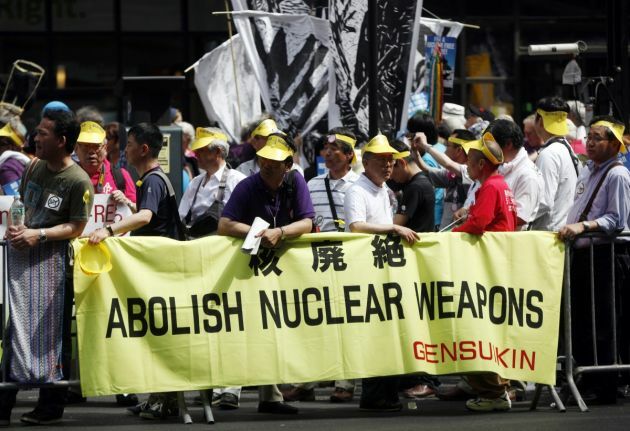 On the eve of the Nuclear Non-Proliferation Treaty (NPT) Review Conference at the UN, thousands of nuclear abolitionists from the U.S., Japan, Europe and other nations rallied, marched and joined a peace festival at the UN. Article 26 of the United Nations (UN) Charter envisages the "establishment and maintenance of international peace and security with the least diversion for armaments of the world's human and economic resources." However, in the decades since the adoption of the Charter, the world has diverted immense stores of material, economic, technical and intellectual resources to the production and maintenance of a vast and growing array of armaments. Far from ensuring peace and security, these preparations for war and violence have locked states into the "security dilemma" of escalating mistrust and fear. They have inflamed and entrenched conflicts throughout world, bringing unimaginable suffering to vast numbers of people. These armaments have diverted precious resources from human needs, hampered human development and human rights, and undermined the cause of human security. They have not made the world safer. The diversion of resources for armaments is also a diversion of the world's cooperative and normative resources. To its enduring credit, the UN has proven itself as a forum for building new norms and treaties in arms control and disarmament. Recent examples include the Arms Trade Treaty (ATT) and expert groups examining the growing use of unmanned and increasingly autonomous weapons systems. Such processes demand sustained international commitment. The difficult infancy of the ATT is making clear the need to improve compliance, capacity and transparency all the way along the chain from where arms are made to where they are put to use. Multilateral forums on drones and lethal autonomous weapons are essential because new technologies cannot be allowed to outpace ethical responsibility and collective commitment to the rule of law. The Article 26 requirement of conscientious limitations on armaments in the service of peace is as holistic as always and more timely than ever. Nuclear weapons demonstrate the dire results of new lethal technologies been allowed to escape the dictates of public conscience and the rule of law. The continued maintenance, modernization and proliferation of nuclear weapons systems represent the pinnacle of humanity's self-destructive potential and the most deplorable diversion of resources for peaceful and sustainable development. We reiterate our common position that nuclear weapons are incompatible with the values upheld by our respective faith traditions which are also foundational elements in the development of international law—the right of people to live in security and dignity; the commands of conscience and justice; the duty to protect the vulnerable and to exercise the stewardship that will safeguard the planet for current and future generations. Nuclear weapons manifest a total disregard for all these basic values and commitments. There is no countervailing imperative—whether of national security, stability in international power relations, or the difficulty of overcoming political inertia—that justifies their continued existence, much less their use. Their catastrophic humanitarian consequences demand that nuclear weapons never be used again, under any circumstances. For decades, the obligation and responsibility of all states to eliminate these weapons of mass destruction has been embodied in Article VI of the Treaty on the Non-Proliferation of Nuclear Weapons (NPT). Progress toward the fulfillment of this repeatedly affirmed commitment has been far too slow, at times imperceptible. The overwhelming indiscriminate and inhumane destructive capacity of these weapons is more than enough justification for their immediate prohibition. And, in times of conflict and escalating tensions like the present – with nuclear weapons being brandished again – it is even more critical to denuclearise both international crises and international conflict resolution. It is high time to put a treaty in place to prohibit nuclear weapons and to finally remove them from crisis dynamics. Cases currently in point are Northeast Asia, the NATO-Russia border and South Asia. We therefore welcome and support the outcome of the Open-ended Working Group to Develop Proposals to Take forward Multilateral Nuclear Disarmament Negotiations for the Achievement and Maintenance of a World without Nuclear Weapons. We urge all governments to support the resolution mandating a conference in 2017 to negotiate a new legally binding treaty prohibiting nuclear weapons and leading to their elimination. Civil society organizations, including faith-based organizations, have a vital role to play in such negotiations, and we call for their full inclusion in the conference and negotiation process. Vote in support of the resolution "Taking forward multilateral nuclear disarmament negotiations", submitted by Austria, Brazil, Ireland, Mexico, Nigeria and South Africa "to convene a United Nations conference in 2017, to negotiate a legally-binding instrument to prohibit nuclear weapons, leading towards their total elimination." Ensure that civil society organisations including faith-based organisations can participate in and contribute to the conference and negotiation process.